Geshe Sopa Rinpoche during long life puja, Deer Park Buddhist Center, Wisconsin, US, July 20, 2014. Photo by Ven. Roger Kunsang. Geshe Lhundub Sopa Rinpoche passed into clear light meditation on August 28 at Deer Park Buddhist Center in Oregon, Wisconsin, US. Geshe Sopa was a preeminent scholar of Tibetan Buddhism, a gifted teacher and an embodiment of the qualities of humility, tolerance and compassion. Born in 1923 in Tsang, Tibet, to poor farmers, Geshe Sopa took novice vows and entered Ganden Chönkhor Monastery at age eight. A decade later, he entered Sera Je Monastery in Lhasa, where he distinguished himself as a devoted and talented scholar. At Sera Je, he taught many important future teachers, including Jangtse Chöje Lobsang Tenzin Rinpoche, Khensur Jampa Tegchok and Lama Yeshe. Geshe Sopa served as a debate partner for His Holiness the Dalai Lama during His Holiness’ geshe exams. He went into exile in 1959 in India and received his lharampa geshe degree in 1962 while at Buxa Duar. His Holiness the Dalai Lama with Geshe Lhundub Sopa in 1989. Photo by Kalleen Mortensen. In 1963, His Holiness sent Geshe Sopa to the United States, accompanying three young Tibetan reincarnate lamas to learn English. A few years later, he was invited to teach at the University of Wisconsin-Madison, where he went on to become a full professor, retiring in 1997. The long list of students Geshe Sopa taught and advised at University of Wisconsin includes many internationally recognized Buddhist studies and Tibetan language academics. In 1976, Geshe Sopa Rinpoche established Ganden Mahayana Center in his home in Madison, which later became Deer Park Buddhist Center in Oregon, Wisconsin. He invited His Holiness the Dalai Lama to give the first Kalachakra initiation in the West, which was held in 1981 at Deer Park. In 1996, Geshe Sopa became a trustee of the International Peace Council, an interfaith organization that promotes peaceful resolution of differences. 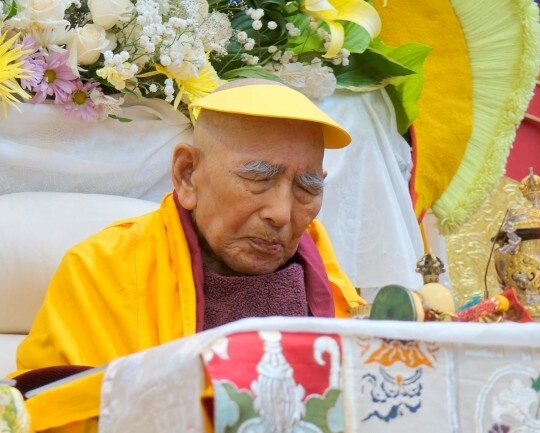 In his last decade, Geshe Sopa oversaw the construction of the impressive large temple at Deer Park, which was consecrated by His Holiness in 2008. Lama Zopa Rinpoche doing prayers with Geshe Sopa Rinopche, Deer Park Buddhist Center, Wisconsin, US, July 20, 2014. Photo by Ven. Roger Kunsang. In 2012, Wisdom Publications released Geshe Sopa Rinpoche’s autobiography, Like a Waking Dream. In it, Geshe Sopa shares detailed memories of his youth and early days in the Tibetan monastic system and offers a first-hand perspective on exile and establishing Tibetan Buddhism in the West. In coordination with the publication of the autobiography, Mandala published remembrances and essays by more than a dozen students of Geshe Sopa and an excerpt from Like a Waking Dream. UPDATE: The Wisconsin State Journal has published an obituary of Geshe Lhundub Sopa. Deer Park Buddhist Center offers a concise biography of Geshe Lhundub Sopa. You can find more stories from Mandala on Geshe Sopa online.